To evaluate flame resistance characteristics of Lapp wire and cable and insure that the products do not propagate flame or spread burning particles within the specified application. These tests are performed to verify compliance with Lapp Flame Resistance Cable Attributes, Industry Tests and Safety Agency Standards. Multiple samples are cut to a specified leangth and then a Kraft paper flag is applied to each specimen. The samples are hung vertically in the support apparatus within the flame chamber. The test is performed in chamber which is completely sealed and free from any air drafts. 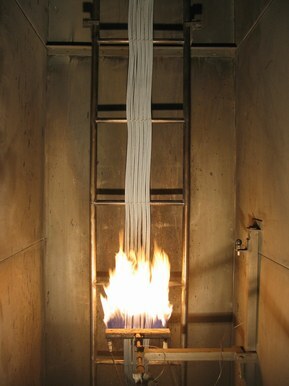 An application of flame is directly applied to the sample in such a manner that flame traverses upward towards the Kraft paper flag. After the specified flame aplication cycle, the flame is removed for a specific time duration. This cycle may be repeated several times. Failure occurs if the sample does not self-extinguish, or if falling burning particles ignite the chamberfloor bedding, or if the Kraft paper flag has been burnt.